Leaders all across the South Georgia Conference have answered the call to serve in their local church setting. As a faithful member of your congregation, we know you want to serve and serve well! 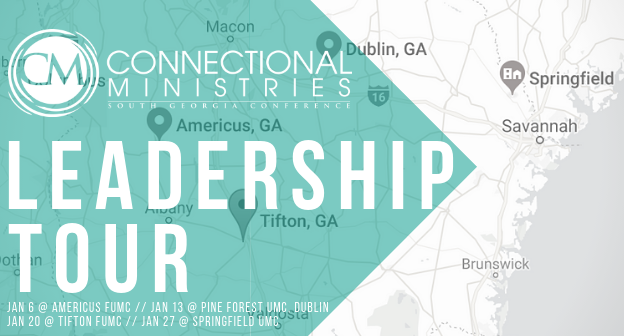 To help equip and empower you in your ministry role, the 2019 Leadership Tour will offer practical teaching and resources to both inspire you and help you lead with confidence. This free event is sponsored by the Office of Connectional Ministries. Download a flyer to promote this event in your local church. A Heart For Justice - The Bible reveals a God who has a heart for justice and a community of faith that exhibits respect and compassion. During our time together we will consider the Biblical witness and explore ways to invite others to join God in the work of transforming communities as we embrace God’s standard of justice. Led by Earnestine Campbell, Ashley Randall or Denise Rooks. Asset Based Community Development - Many churches approach ministry from the lens of scarcity rather than abundance. This workshop will share tools to help you shift your mindset and begin to see the abundance of resources around you- within your church, your community, the connection and beyond. Led by Allison Lindsey. Church Security - In light of our culture today, there is a heightened awareness to issues of security within our local churches and keeping our members safe. Come learn some basics of church security and how you can best navigate needs for your specific ministry context. Led by Michael Snapp, Chris Braswell or Jimmy McDuffie. Finance Committee - The Finance Committee has the responsibility of managing the church’s money and creatively supporting missions, ministry and operations within the local church. Gain practical tools on giving oversight to the resources God provides. Led by Derek McAleer. SPRC - Helping the pastor and staff have an effective relationship to the congregation is the role of the SPRC. As the connection to the staff, church and DS, gain insight to avoid being the “complaint department.” This presentation offers practical training on how to fulfill these responsibilities. Led by Nita Crump. Age Level Ministries - Jesus challenged His culture to shift the way they thought about children. What if we started acting like what we do for children and youth is more important than anything else we do? Come learn how to implement long term missional strategies for all ages, gaining tools to strengthen your ministry. Led by Suzanne Akins, Nicole Lawson, Allison Vandenberg or Annie Paulk. Apportionments - One way the strength in the connection is evident is in the way our local churches partner in paying “a portion” to collectively contribute to mission and ministry all over the world. Come do a deep dive into the ministry behind the dollars and see how far-reaching your impact is for kingdom building! Led by Allison Lindsey. Church Membership Roll - The names on your church roll are people connected to your congregation and keeping track can be a valuable tool for ministry. Learn how to better represent your active congregation with a consistent system for monitoring members. Led by Nita Crump and Lee Smith. Lay Leaders - An effective Lay Leader functions as a role model for Christian discipleship and faith lived out in the church and in daily life for the people of a congregation. The Lay Leader works with the pastor to fulfill the mission and vision of the congregation. Come learn more about the dynamic role of this leadership position. Led by J. Knapp. Lay Member to Annual Conference - The Lay Member to Annual Conference serves as the connection between the local church and the annual conference. Learn what it means to hold this important position, how to prepare for Annual Conference and how to communicate to keep your congregation connected. Led by Karen Forrester. Trustees - The upkeep of a church’s facility can be a large task if plans are not made to be proactive and intentional when planning ahead for future needs and maintenance. What do you do when your church faces a huge repair bill? Come learn practical, intentional ways to plan ahead. Led by Chris Calhoun or Steve Waldorf.